When Tony LaBarbera saw that the Illinois Entertainer was starting a new heavy metal magazine, he kept his own counsel. He saw what was happening--the four-color covers, the paucity of local coverage, even the potshots that those in the know could see were directed at Tony and his friends--but kept quiet. But when a letter to the editor said that the new Chicago Area Music Magazine, or CAMM, would relegate Tony's own publication, Chicago Rocker, to its "proper place, right next to the toilet paper dispenser!" Tony got mad. His response, a 3,000-word combination j'accuse and mea culpa--rather incongruously entitled "That's Why There's Democrats and Republicans"--was published in the Rocker a few months ago. With it died whatever possibility there had been for peaceful coexistence. "So, Tony, what do you think of CAMM? 'THEY CAN GO TO HELL,' TONY REPLIES!" he wrote, the boldface his own. The essay has to be read to be fully appreciated, but along the way LaBarbera concedes some possible faults ("There are a few people who will never volunteer to be the president of the Tony LaBarbera Fan Club"), settles some scores (CAMM ad director Mike Engel "is the most arrogant, rude, obnoxious jerk I've met in a long time"), and makes some penetrating observations on the subject of journalistic objectivity: "In the first issue they made a specific point about giving coverage to bands that DESERVE it. Who makes that distinction?" "I guess freedom of the press is so much easier when you own it," the essay concludes. LaBarbera himself calls his publication a newsletter, and to his credit he makes no pretenses at all about the Rocker's intents, which focus primarily on promoting LaBarbera's business and the local heavy metal scene, not, again to his credit, necessarily in that order. On the other hand, since LaBarbera dominates the scene like no one else, to a large extent the two objectives are the same anyway. "We have no journalistic integrity," he boasts cheerfully. "Our reason for being is to promote and hype." LaBarbera's Shark Entertainment publishes the Rocker, books bands into River Grove's Thirsty Whale and Palatine's S.O.P. 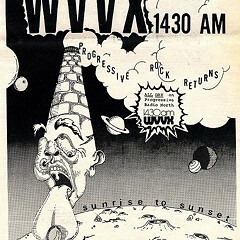 's, runs concerts at the Gateway Theatre in Jefferson Park, produces a radio show once a week on WVVX (LaBarbera is the DJ), and manages and promotes any number of local bands. At 28, LaBarbera's been in the business for ten years and employs four people full-time. If you're accustomed to reading anything other than the back of cereal boxes, Chicago Rocker is of course a dreadful piece of work; and despite LaBarbera's candor there's something depressing about a magazine whose staff box boasts the title "Editor/Ad Representitive" (sic). But then again we're talking about suburban kids who listen to and play in bands like Cuttlass, and Strych-9, and Cherri, and if it's worth 50 or 100 bucks to them, or their parents, to get their picture in the paper, LaBarbera's their man. And what about CAMM? Illinois Entertainer is owned by David Roberts, under the nom de journalism of Roberts Publishing. (Roberts also owns a handful of mainstream west-suburban dailies.) Ironically, the Entertainer itself used to have a decidedly heavy-metal bent. "We've been trying to get rid of the impression that we're a suburban heavy metal rag for years," says the paper's current editor, Mike Harris. Spencer says CAMM's doing great, thank you, despite the flack from LaBarbera. "It's far surpassed any expectations we had at this point," she says. His outburst in print surprised her, she says, with just a hint of disingenuousness: "I was stunned. We in no way intended to hurt Tony. We think there's a market for both of them." CAMM hasn't yet taken control of its cover--sure, it's four-color, and glossy, but it always manages to look somehow monstrous--and the writing hovers at about Rocker level, which is to say that it seems to be written mostly by enthusiastic sixth-graders. The magazine's one secret weapon may turn out to be, ironically enough, ad director Mike Engel, the guy LaBarbera called arrogant, rude, and obnoxious, who writes a relatively hard-hitting column called "Inside Info." "Rumor on the streets these days," ran a recent item, "is that two of Chicago's top drawing pretty boy bands are going to defect to the west coast in the early fall. Well, good luck! Cause your [sic] going to need it, out there your [sic] just another garage band. And by their standards, you're not even cute. You'll be back with your heads hung low." Concertgoers arriving at the Paul McCartney show at Soldier Field before show time were greeted with a shocking sight: walking along the stadium's west wall, they would have reached a small rise and gazed down at the entrance area, aghast. There, beneath the giant pillars of the stadium, massed thousands upon thousands of people, looking for all the world like the players in a revolution in a medium-sized Central American country. The cause of the huge crowds was that there were exactly two doors open. The more sensible of the concertgoers turned around, bucking the advancing crowds, and walked back to the field's north end, and from there down its east side; but there they were greeted with a parallel sight, right down to the two open doors. The show, fortunately, started late, and from inside it looked as if relatively few missed its beginning; but certainly a hefty percentage of the 55,600 attendees spent an incredibly long time crushed in lines because someone had seen fit to open only perhaps a half dozen of Soldier Field's dozens of doors. Who? At the show, a security person said the Chicago Park District was in charge; but a District flack last week said they were referring calls to Stardate Productions, in Milwaukee. A Stardate flack passed me off to the Joseph Entertainment Group, the Milwaukee-based promoter that books most of the Alpine Valley shows, among other things. Joseph Entertainment said that the show was an elaborate coproduction of themselves, Stardate, and Ogden Allied Entertainment Services (Chicago's Jam Productions had a piece of the action as well), and that it was Ogden Allied, in conjunction with the Park District, that handled the doors. What happened, says Ogden Allied's director, Fred Ordower, was that the day's early evening rainstorm, combined with a power blip related to the Com Ed blackout that night, postponed the opening of the stadium doors from the scheduled 6:30 to about 7:10 and created the huge crowds. Ordower said that there were originally nine gates open, with a total of 25 ticket takers; the company added, he said, four doors and eight more takers around 8 PM. Ordower copped to the screw-up, and apologized to the fans: "It all produced an environment less pleasant than we would have hoped," he said. "We're very sorry for the inconvenience, and next time we'll have contingency plans in place." Still. After 20 years of outdoor concerts, you'd think someone somewhere would be able to deal with a little rain. (The fans are expected to, after all.) The result was another example of what I like to call "fan abuse": it's symptomatic of the prevailing attitude in the rock 'n' roll industry generally, which is that the fans come last, period. The McCartney show was one of those ridiculous big-ticket affairs that embarrass almost everyone involved: from McCartney, who didn't pull the show off well, to the Chicago Sun-Times, which "presented" the show at a high cost to its credibility, to Ogden Allied and Joseph Entertainment, which demonstrated that they couldn't pull off a stadium show competently, to the Park District, which leased out Soldier Field without adequate controls being guaranteed, to the fans, who showed yet again that people who act like sheep will be treated like animals.